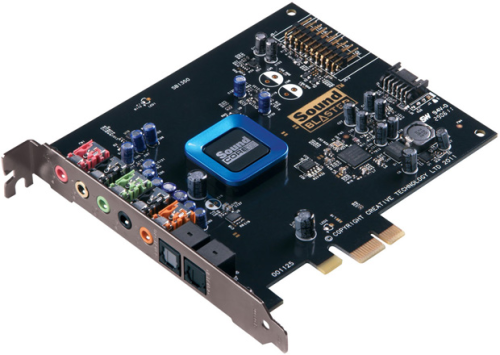 It's been awhile since Creative Labs has released an all-new audio processor design for their sound cards; the E-MU 20K chip and its variants have been behind most of the company's Sound Blaster X-Fi branded cards since 2005. But at long last, Creative has officially announced the Sound Core3D – a design that combines four processing cores and several components into one plastic square – alongside a brand new crop of sound cards to take advantage. A 6-channel DAC (digital-to-analog converter) and a four channel ADC (analog-to-digital converter) are built-in to the Sound Core3D chip. Both are capable of 24-bit audio streams and have signal-to-noise ratios of 102dB and 101dB, respectively. These two parts are usually provided using a number of components on the sound card and adjacent to the audio processor – not so with the Sound Core3D. Also on tap is a headphone amplifier, a digital microphone interface, and S/PDIF inputs and outputs. The 'Core3D puts an emphasis on increased quality audio playback and microphone use – THX TruStudio Pro support and CrystalVoice support are present to help. All this in a likely power-sipping and small 56-pin package. Creative is also offering a version of the Core3D catered to consumer electronics devices (such as set-top boxes) as well. A series of sound cards using the Sound Core3D chips dubbed Sound Blaster Recon3D will come available at the end of this year starting with the base model. “Fatal1ty” branded Professional and Champion models with more features and extras will appear early in 2012, but for most of us I'm sure the standard Recon3D will be enough. UPDATE: The Sound Blaster Recon3D series is now available at Amazon here and at other retailers. Ever Wonder What Your Garden Is Missing? Why Not Robotic Lamps? Now if they would just produce decent drivers. Ahh who am I kidding that will never happen.